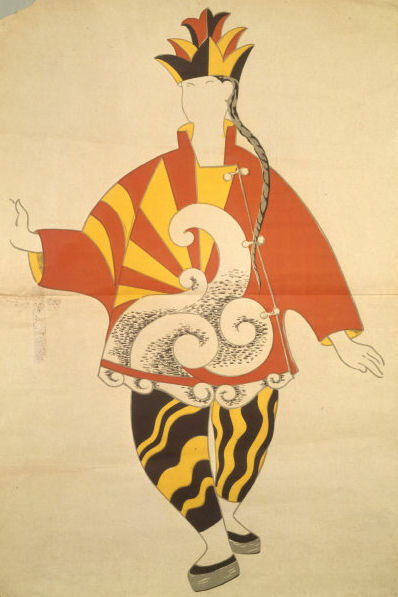 Yes, Pablo Picasso designed this costume for the Ballets Russes’s Parade in 1917. Picasso was asked to design the costumes for several Ballets Russes productions, including Le Tricorne (1919), Pulcinella (1920), and Cuadro Flamenco (1921). 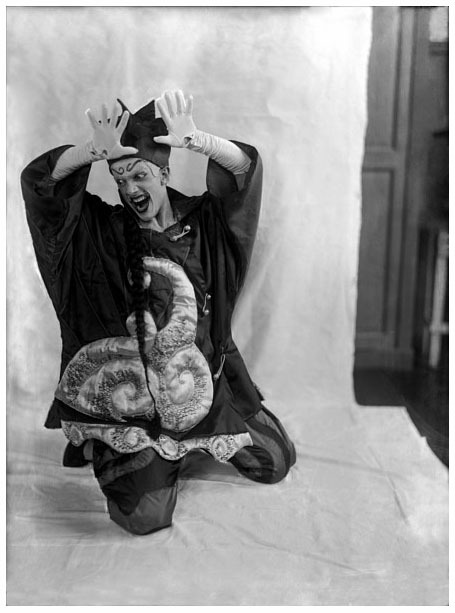 It was not unusual for famous artists to be involved with these modern performances; Léon Bakst, Henri Matisse, and Georges Braques were also commissioned to create costume and set designs for the Ballets Russes. Glass negative by Lachmann showing Léonide Massine as the Chinese Conjuror in his ballet Parade, Diaghliev Ballets Russes, 1917. © Victoria and Albert Museum. For more images of these costumes, please visit the Victoria and Albert Museum’s online collection. Bowles, Hamish. 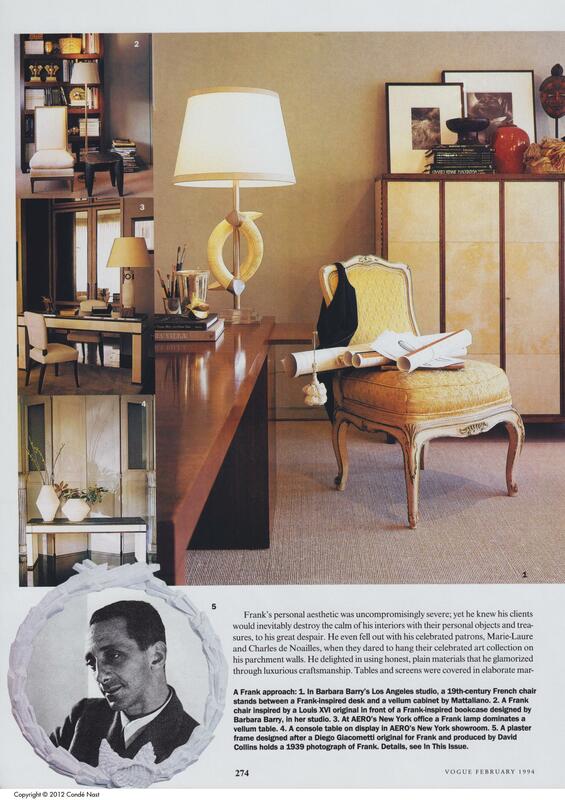 “Vogue Style: Living: To Be Perfectly Frank.” Vogue, 1994. Coat of embroidered wool with gold thread, designed for Marie Cuttoli, retailed by House of Myrbor, Paris, 1925. © Victoria and Albert Museum. 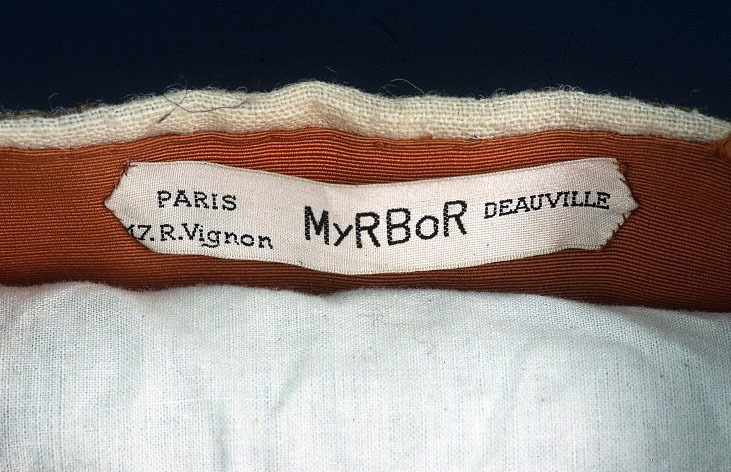 House of Myrbor label from 1925. © Victoria and Albert Museum. House of Myrbor closed in 1936. While few of Myrbor’s garments and textiles remain, these few examples can be found in various costume collections, including the Victoria and Albert Museum and the Metropolitan Museum of Art. Some of the hand-woven rugs bearing Picasso’s designs can be found for sale though online art auctions. Picasso’s later textile designs, in the 1950s and 1960s, are vastly different from his early cubist designs. Their strong lines and colors create bold repetitions of household items and simple shapes, which become frenetic patterns of entangled abstractions. 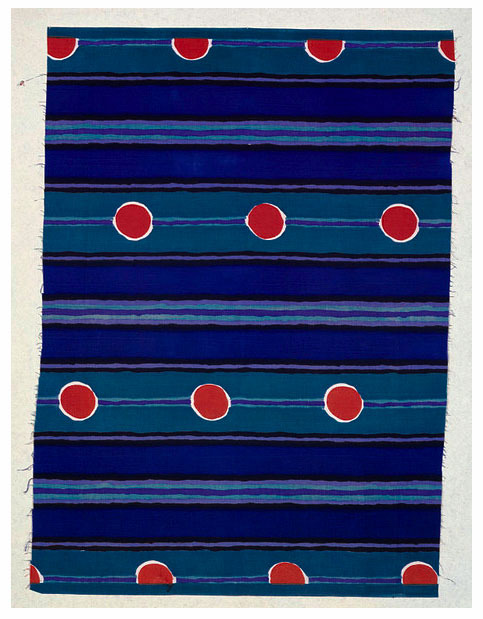 Examples of these textiles are widely available in museum collections around the world. Picasso, Pablo for Fuller Fabrics. “Notes,” 1956. © Victoria and Albert Museum. What is most remarkable about Picasso’s textile designs is their commercial viability. Picasso reacted strongly to changes in the marketplace, and continued to offer fresh and relevant designs for over four decades. 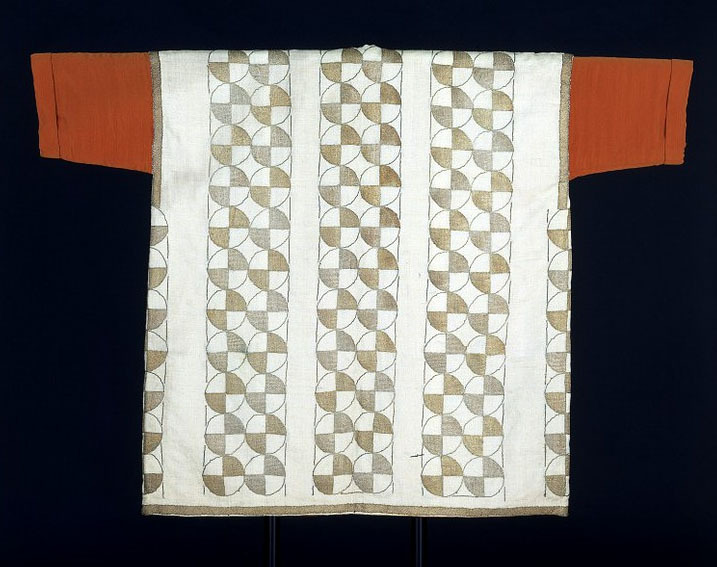 I could not find any examples of Picasso participating in garment design beyond his designs for the Ballets Russes, but his many textile designs demonstrate how easily his artwork transitions to the woven canvas. Further evidence of this is found in some of Gilbert Adrian’s designs from the 1940s. 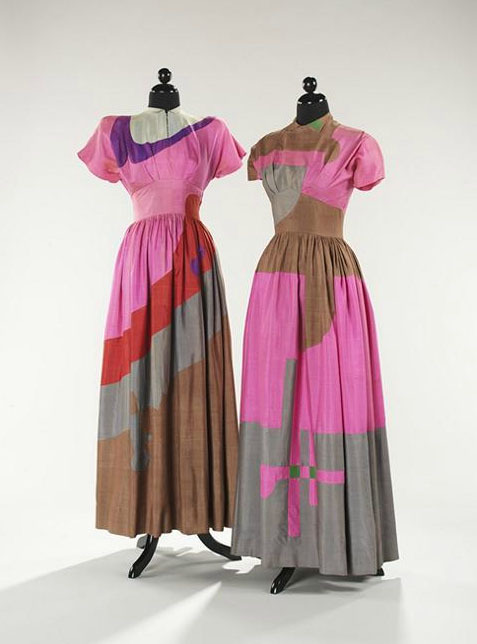 Adrian’s adaptation of cubist paintings into hand-sewn garments became his signature style. His creations, made from brightly colored fabrics cut in unusual shapes, are strikingly similar to paintings by Picasso and Braques. Adrian, Gilbert. Dinner Dresses, silk, c 1944. © The Metropolitan Museum of Art. I hope that you enjoyed this brief introduction to Ballets Russes, Picasso’s textile and costume designs, House of Myrbor, and Gilbert Adrian. Hopefully, it has inspired you to learn more about something or someone. What next’s week’s mystery? Visit us on Monday and find out! Bayer, P. Art Deco Interiors: Decoration and Design Classics of the 1920s and 1930s. London, 1990. The National Gallery of Australia, Ballets Russes: The Art of Costume. Online Collections Database, Victoria and Albert Museum. Online Collections Database, The Metropolitan Museum of Art. Thank you! 🙂 And thanks for correcting my error.